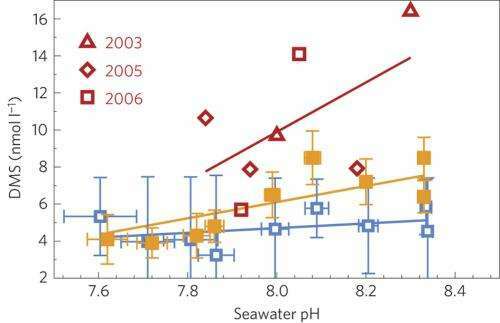 Figure 1 : Observations of reduced DMS concentration with decreasing seawater pH from different mesocosm experiments. Scientists at the Max Planck Institute for Meteorology (MPI-M), Dr. Katharina Six, Dr. Silvia Kloster, Dr. Tatiana Ilyina, the late Dr. Ernst Maier-Reimer and two co-authors from the US, demonstrate that ocean acidification may amplify global warming through the biogenic production of the marine sulfur component dimethylsulphide (DMS). It is common knowledge that fossil fuel emissions of CO2 lead to global warming. The ocean, by taking up significant amounts of CO2, lessens the effect of this anthropogenic disturbance. The "price" for storing CO2 is an ongoing decrease of seawater pH (ocean acidification), a process that is likely to have diverse and harmful impacts on marine biota, food webs, and ecosystems. Until now, however, climate change and ocean acidification have been widely considered as uncoupled consequences of the anthropogenic CO2 perturbation. Recently, ocean biologists measured in experiments using seawater enclosures (mesocosms) that DMS concentrations were markedly lower in a low-pH environment (Figure 1). When DMS is emitted to the atmosphere it oxidizes to gas phase sulfuric acid, which can form new aerosol particles that impact cloud albedo and, hence, cool the Earth's surface. As marine DMS emissions are the largest natural source for atmospheric sulfur, changes in their strength have the potential to notably alter the Earth's radiation budget. 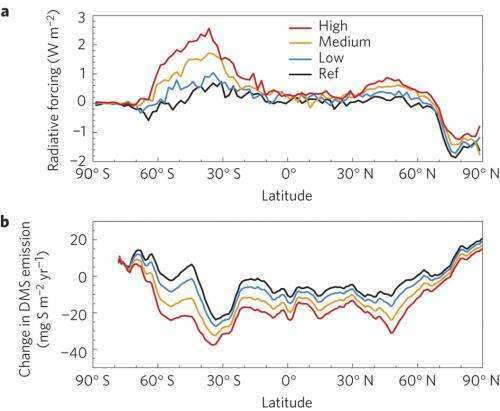 Figure 2 : Zonal averaged changes in radiative forcing (a) caused by the projected changes in DMS emission (b) for three sensitivity experiments (high, medium and low) based on the relationship shown in Fig.1 (same color coding) and a reference run (Ref). Based on the results from the mesocosm studies the researchers from the MPI-M have established relationships between pH changes and DMS concentrations in seawater. They projected changes in DMS emissions into the atmosphere in a future climate with enhanced ocean acidification using the MPI-M Earth system model4. In the journal Nature Climate Change it is demonstrated, that modeled DMS emissions decrease by about 18 (±3)% in 2100 compared to preindustrial times as a result of the combined effects of ocean acidification and climate change. The reduced DMS emissions induce a significant positive radiative forcing of which 83% (0.4 W/m2) can, in the model, be attributed to the impact of ocean acidification alone (Figure 2). Compared to the Earth system response to a doubling of atmospheric CO2 this is tantamount to an equilibrium temperature increase between 0.23 and 0.48 K. Simply put, their research shows that ocean acidification has the potential to speed up global warming considerably. Less sulfur aerosols is basically less smog. The laugh test for climate alarm is creeping up on Democrats now, rubbing off on them, frozen deer in headlight glare. How hard is it really for thousands of coal plant sulfide scrubbers to be tweaked to indeed take advantage of these results that show that small adjustments can indeed cool the planet as needed and have bigger effects than the traditional greenhouse effect? Might cleaner air initiatives explain recent warming too? Seriously. "Dry scrubbing systems are often used for the removal of odorous and corrosive gases from wastewater treatment plant operations. The medium used is typically an activated alumina compound impregnated with materials to handle specific gases such as hydrogen sulfide. Media used can be mixed together to offer a wide range of removal for other odorous compounds such as methyl mercaptans, aldehydes, volatile organic compounds, dimethyl sulfide, and dimethyl disulfide." Professor Lovelock said the the oceans cool themselves by releasing di-methyl sulphide into the air to form the nucleus of water droplets and thus make clouds. Another controling feedback mechanism bites the dust. DMS is that odour you get from fresh fish. If you add up all the alarmist propaganda about global warming, there can only be one conclusion. We're inevitably going to burst into flames. @nik - you are far from the first to suggest that reducing sulfur emissions from coal burning has contributed to recent warming. But there are problems with using such emissions to counteract the heat-trapping of CO2. For starters, remember the acid rain caused by sulfur dioxide emission? If we keep pumping out CO2 and pump out enough sulfur dioxide to compensate, the rain would become more and more acidic. (This is why sulphate geoengineering advocates propose dispersing sulphates above the troposphere, so that the sulfur doesn't rain out). Also, the atmospheric lifetime of the sulphate aerosols is far shorter than CO2, so if we were to stop the sulfur the warming could catch up over just a few decades. H2O do not forsake us! So are they saying lightning is warming the ocean? That's my take away, but I really didn't read the article. A picture is worth a thousand words! Lightning converts DMS into MSM, which is the most potent form of sulfur mammals can eat. The aloe vera plant is 50% MSM which contributes to it's healing properties. "like global warming science today, the "consensus" science in 1990 — which argued that Midwest power plants were destroying Northeast lakes with acid rain — was bunk. National Acid Rain Precipitation Assessment Project) study published in 1989 – which took ten years and cost $500 million, the most comprehensive federal study ever undertaken — proved that acid rain was a minor nuisance and that passing expensive regulation would do little to address the supposed problem. claimed the exact opposite of what the Conservative Propaganda outlet claims. NikkieTard is a fine example of a lying Republican. Wow! Somehow natural CO2 emissions don't do this. This just shows how evil we all are. I wonder if they factored in the huge increase in plankton due to Co2 fertilization? I'm thinking it doesn't suit their preconceived agenda. p.s Vendicar. I'm a Democrat. The irony of his armageddon is that if our artificial energy rationing perma-recession does slip into a sudden depression, it will be exactly because of green boondoggle money wasted via debt financing. It's time you made up your mind. You can either pretend to be a scientist knowledgeable on the subject of climatology (or, alternatively, you could try to get a degree in a subject with a little more bearing on the topic than carbon chemistry, a degree you believe makes you an expert on everything - what we might call a Sheldon Cooper-complex), thus using scientific arguments to make scientific points, OR you can be an annoying Republican pundit using every chance to hurl slurs at democrats and imply conspiracy theories by some imaginary leftist NWO. What you can't do is what you're doing right now - trying to combine the two. You can be a scientist, you can be a propagandist. But the two DON'T BLEND WELL. I see the same group here, having the same conversation. Please, stop wasting your time. It must be multiple hours spent daily from both sides simply arguing the exact same things. Are you A) changing any minds, or B) Keeping the conversation intelligent? It's embarrassing to read most of the time (particularly of one viewpoint). If I can help communicate anything it would be to the majority of real users of this site to disable comments via your account. Yes, you can do that, it just requires you to sign up. There's 100,000 fans on Facebook of physorg (of which I'm actually not) -- So likely multiple hundreds of thousands of uniques. Yet, there's a whopping 20 who actually argue as quickly as the articles flow, ruining the experience for the 99.9995%. I feel sorry for the properly intelligent people who get drawn into the nonsense. I see the loss of human potential here on a daily basis, and I've pretty much had it. Comments are off, for good. Hate to say this but Organic Chemistry is a hard science, climatology at this point in time is, at best, a soft science. I try to stay out of arguments because I prefer to look at both sides but all I see from the side supporting the idea of anthropogenic global warming are ad hominems. Models are but a tool, but incredibly dangerous when inaccurate assumptions are artificially amplified... People have brought up valid arguments regarding the validity of the data collection which have not been addressed. Faulty data will, in all probability, cause faulty models. I have watched Nik provide arguments that never go refuted, and I must assume its because you all have no response. I have in turn watched VendicarE provide non-stop verbal assualts and even death threats to those of the opposing viewpoint. Do I agree with Nik? Not necessarily, but when valid points are raised, the point of a debate is to address them, not the person. No. I am the same ThomasQuinn who is an award-winning social- and political historian that goes by the name of Caspar Mulders in real life. Also, I invariably spell ThomasQuinn without a space, not in the last place to differentiate it from a real name. First off, I'm not saying carbon chemistry isn't "hard" or "real" science, I'm simply saying a degree in carbon chemistry doesn't qualify Nik to dismiss scientific claims in other fields offhand. He, on the other hand, considers himself an expert in the field of Everything. What I mainly see from Nik is political nonsense like "The laugh test for climate alarm is creeping up on Democrats now, rubbing off on them, frozen deer in headlight glare." and personal attacks like "Are you the same grant seeking Thomas Quinn who is selling a boozy green energy scheme here?". There is nothing the least bit scientific about that, and any real scientific arguments he might offer from time to time are ruined by the fact that he buries them beneath verbal cr*p like the above examples. If only I could scroll down to the bottom of a phys.org article and for once read comments that are having a meaningful and interesting conversation about the article. I don't know why I bother to read through them these days all you get is personal insults and political arguments. This site could be so much better if the comments section was actually populated with insightful debate and discussion. Caspar, history reveals that consensus in science is very often just bogus, right? An ether pervades space, continents don't move, dirty hands don't kill patients, children are blank slates, non-coding DNA is "junk," infections don't cause ulcers, bacteria spontaneously generate, cholesterol and fat intake control heart disease and thus follow the Food Pyramid, and carbon dioxide controls the climate so mind your Carbon Footprint Counter. These little mistakes are normal business but they are terribly destructive if politics and arrogance extend them out for decades after they have been technically debunked as quotes form frantic climate modellers have now indicated is the case with Global Warming (via their massive water vapor amplification of the classic greenhouse effect). Caspar, the Republicans were easy to get through to for us skeptics after Climategate, via Limbaugh and Beck. To try to break through to Democrats, a bit of low budget activism is in order, not silence. "I live in The Netherlands, and nobody here tells Jesus jokes. You know why not? Because religious nuts don't have any power here. These jokes only exist because of the power deranged religious fanatics have in some parts of your country. We don't have to make Jesus-jokes, for the simple reason that we realize that the Jesus-freaks themselves are the jokes." I have the exact same sentiment but the doomsday religion involved has now completely infected my favorite science site, a situation that the vast majority of skeptics also lament was the reason they cancelled their formerly treasured subscriptions to the likes of Scientific American, Discover, and Science News, in my case all three! Bible Belt Republicanism doesn't lead to science magazine subscriptions in the first place. Human beings evidently have an innate affinity for religion, some more than others, and the parallels between Climatology and Christianity are ridiculously congruent. You haven't been watching closely then. I have several times pulled up his "mistakes" on meteorology/climatology ( see profile ) - The last one which actually (fair-play) elicited an admission of error. Namely that Antarctica, as a whole was "mildly but steadily cooling". As I've said to him. I'll not teach him chemistry and at he cant teach me anything about Meteorology. Oh, you must have missed all the ad hominems by the other side too. There is evidence aplenty for AGW without GCM's. Correlation and causation physics alike. VDE is a one off - his science is sound, but I do not approve of some of his responses. @Nik - Having lived in the northeast woods for over 50 years, I have seen firsthand the reduction in maple sapling density during the acid rain years (along with reduced crown cover which would normally increase sapling density), and the subsequent recovery after sulphate reduction, especially on calcium-poor soils. And that was just enough sulphate to counteract the increase in atmospheric CO2 through 1980 - we are already twice as far above pre-industrial CO2 levels, and climbing rapidly. Note that I am not dismissing (or supporting) sulphates in the stratosphere - just your point on cleaning up sulfur emissions from coal. If you are saying that the cleaning up of coal smoke was wrong, please go live in Bejing where they still have the coal smog that you appear to be promoting - sulphates, fine particulates, mercury, etc. "Note that I am not dismissing (or supporting) sulphates in the stratosphere - just your point on cleaning up sulfur emissions from coal. If you are saying that the cleaning up of coal smoke was wrong, please go live in Bejing where they still have the coal smog that you appear to be promoting - sulphates, fine particulates, mercury, etc"
in commenting on Nik's post. If I could have given you a 10 I would have. Nik seems to be the kind of an academic that gives academics a bad name. The idea that a chemist could possibly not understand the amazing improvement in the environment that came about due to the reduction of SOx emissions just points out what a poor chemist he must be. ^It doesn't have a carbon atom, so he doesn't care. Wait - that's it! Nik isn't a shill for the Kochs or others - he's a crusader for what he sees as the much-maligned carbon molecule in all of its forms. It should be as loved as a colorless odorless byproduct of combustion as it is when fused into a diamond! I must apologize for missing the personal attacks from Nik, the sheer volume in the other direction is overwhelming. Also I have generally seen the anthropogenic warming crowd draw first blood, and while I do not think responding as such is effective, it is justified. So you decide to attack me as I did not lock step to your tune? I am fully capable of reading, as I am in analyzing data and how those methods affect the stated results. Runrig you have stated you were a meteorologist, congrats? If that is the case, you are most likely familiar with weather, not climate. In the words of Lewis Black, you know what meteorologist means in english? Liar. If you can provide links to some of these refutations I would be interested in the accounting for the southern drift of the ocean measurement points, the normalization of localized surface measurements due to urbanization, amoung many other issues. That sir says far more about you than ever it does about the science of meteorology, because you equate it with a man on a tv and think that because he is wrong sometimes weather forecasts are always wrong and Meteorologists worthless. Do you think I've not heard that before? And typical of certain people on here who have no respect for authority of knowledge. Tell me your profession and I'll ridicule that for a cheap joke. If you can provide links to some of these refutations I would be interested in the accounting for the southern drift of the ocean measurement points, the normalization of localized surface measurements due to urbanization, among many other issues. Look for them yourself - there is a search function you know. Ah runrig, it was a joke, not a personal attack. Your behavior is very revealing to what kind of person you are though. "You are not in the least bit unbiased. The pro science group almost never draws first blood"
If posting an opinion different from your own constitutes a personal attack, there is a problem, and its not with them. Overdramatic much, and how do you even support such a statement? And side note. When I was giving my thesis I was encouraged to mention global warming... not based on science. But for funding reasons. Very revealing is it not? .. it was a joke, not a personal attack. Your behavior is very revealing to what kind of person you are though. I said: "Tell me your profession and I'll ridicule that for a cheap JOKE"
A joke .. in very poor taste, as you well know and one I am bound to be sensitive to. I reacted to your insult and that makes me revealing (?) Your snide remarks about Meteorology came first. "Authority of knowledge"? If you are referring to yourself, that is quite arrogant. You're a hypocrite as well, as you have not mentioned your Nik who brags about having a phd in Chemistry (now that is relevant in climate science). @ Thermo - thanks. One of my summer jobs was measuring plant growth for some of that research, so it brought back memories. The idea that a chemist could possibly not understand the amazing improvement in the environment that came about due to the reduction of SOx emissions just points out what a poor chemist he must be. What it does show is how OUTSIDE of his area of expertise, Nik's comments are not to be taken seriously. Within his field he may (or may not) be a solid scientist. Some scientists are broad-minded observers, while others are so focused on their work that they don't notice the world around them, and Nik may be that kind. Nik also lives in New York City, so he may not have much experience with clean air. When my brother lived there he said that he didn't trust air that he couldn't see. And NYC air isn't spectacularly bad, either (thanks to wind and to the clean air laws that Nik appears not to like). ......and where I have have the knowledge - that's not arrogant - it's just obvious sense. Now go tell that to Mr Nik. You are clearly not an "Unbiased observer" as all you've done on here is make snide remarks at the defenders of science and "big-up" the denier. You are demonstrating that now in denigrating knowledge of science. Climate is a long period of weather. To say I am not qualified to talk of climate is like saying that although I know about the workings of a heart I cant possibly know anything about the long term life of a heart. "features often cited as characteristic of hard science include: producing testable predictions; performing controlled experiments; relying on quantifiable data and mathematical models; a high degree of accuracy and objectivity; and generally applying a purer form of the scientific method." No doubt my idea of accuracy and yours will differ but whatever. I lurk, the death threats I saw on this site were too much and I had to create a profile. You cannot stop the personal attacks can you? You still don't see your hypocrisy do you? If they don't BELIEVE what you do, they are anti-science, when the banner cannot and does not belong to you. I was curious what it would look like if Nik created a sockpuppet. His narcissism, I figured, wouldn't allow him to keep his credentials or other facets he considers important to that self aggrandized construct he calls an ego quiet for long. He found a way. A rather onanistic way, but a way. djr, the only thing correct with your statements is that the goal of science is to try to understand how nature works. You seem to have associated models with science, which they aren't. You have associated a predetermined outlook as the true regardless of data or logic, instead substituting models. Are models a useful tool? Yes! But when they are accurate and can be supported and work with experimentation. You do not hold the banner of science, you burned that flag when you could not and would not seperate yourself from your preconceived opinions. Let us not leave your other alt "Restrider" out of this... after all, who else is going to admire your admiration of yourself? I mean, only somebody as brilliant as you could invent metastroking. Climatology meets very little of those requirements. Testable predictions & controlled experiments- you are looking at the world. Hard to test to begin with. Variable elimination? They have even gotten all the variable on paper, let alone proper weights, and furthermore started full variable isolation. However, they then use models that fail to accurately predict current conditions without excessive error bands. Relying on data, not if flawed data collection is the basis... Climatology has not demostrated a pure scientific method for a long while... sadly. And that just about confirms it. gmr- You do need help. That is not normal or acceptable human behavior. You will shatter djr's belief that humanity is 'evolving' with such unscientific foundations. Side note your obsession with Nik is troubling. An interesting twist to this would be gmr is actually an alternate personality of Nik that obesses over its other personality in a constant struggle for dominance... But in all seriousness, that's not healthy. "They have even gotten all the variable on paper, let alone proper weights, and furthermore started full variable isolation." "They have not even gotten all variables on paper, let alone assigned the proper weights and haven't demostrated variable isolation." With the addition of projection, I'd almost call it a closed case. Really, it was the extremely biased and self-blind admiration you posted that was the clue. A person as self aggrandizing as apparent from previous devolvement into swinging credentialism can't seem to resist the idea of self promotion. I have not made my personal opinion known. I have expressed a discontent with the lack of scientific engagement as opposed to name calling and personal attacks from the anthropogenic global warming supporters. I have expressed that there is a problem with over reliance on untested and unproven models which do not have a readily available experimental platform. I have also expressed that is there is problems with non-isolated data masquerading as such. Just as I will probably never met you, I will not meet Nik. I don't know who he or she is. Just as I don't know who you are. I'm not sure why this other person who claims to be not you keeps responding to posts titled and addressed to Nik. Especially given that one could presume to ignore posts that are directly addressed to somebody else. I'm leaning towards a rare case of narcissism combined with a severe undiagnosed learning disorder, which would be hard for you to see in yourself after being told for 42 years that you were special and mommy's little angel. Narcissism doesn't spring from nurturing parenting, by the way, but from deeply seated insecurity that necessitates tearing others down as well as exaggerating achievement. gmr- You attacked me and then claim to be a victim when I respond.... You have offered nothing but insults. You have a problem. Correction: my comments were directed at Nik. And if you are Nik, I'd hope your effort to provide a pseudo-external validation would maybe guide you into the notion that your strident tone and obsession with your own PhD will neither win friends nor influence people. You could try contributing without hyperbole and in a reasonable manner and see what thay does. Oddly enough, I'd wipe the slate clean in that case. You signed up on here very recently under the name "Unbiased Observer" and came on with a post praising a noted "skeptic" (though only a denier would reflexively criticise all AGW related science and those at the head of that science). Namely NikfromNYC. In reply I merely pointed out that you must not have noticed posts that countered his omniscience and mentioned one such that I had caught him out on (and graciously said he acknowledged same). You then came back attacking Meteorology (with a bad taste joke) and proceeded to slate "Meteorology and Climateology" as "soft sciences" - which I then pointed out to you were not. Back you come again in an obvious attempt to ridicule the science once more and inflate your's/denier's self-importance and rightness in their criticisms. Again, both Met. and Climate., are studies of the atmosphere and the climate system. They gain knowledge from observation and study and produce testable prediction via NWP and GCM models, which are continually evaluated and improved against new knowledge gained from those studies. In the case of Meteorology verification of forecasts and improvement on modeling is continuous. BTW: I performed an experiment every time I went to work - I forecast the weather and observed it's behaviour against that forecast//model, it then going into my knowledge bank for the next time. In it's wider context atmospheric models are similarly influenced. The planet is the laboratory, performing the experiment 24/7. Now, can you please lay off. You are not going to turn logic on its head by implying that the more you know, then the less you know. and vice versa. Unbiased said: "I have expressed that there is a problem with over reliance on untested and unproven models which do not have a readily available experimental platform. I have also expressed that is there is problems with non-isolated data masquerading as such." Can you please explain what you mean by "...non-isolated data masquerading as such..."
You were quite obvious with your attacks. You made a decision to attack someone because they didn't agree with you. I offered no insult to you, but that made no difference. There is no doubt that you need help, I can only hope that you seek it. runrig- so you start with an attack, how tried and true of the anti-science crowd. I have addressed your first point already. You seem to lack reading comprehension as well. Was that the reason you were forced into retirement? I praised the person, that over the course of time, I noticed would actually attempt to debate. You have not displayed such without attacking the person if you even tried to refute a point. Neither are hard sciences. You have not addressed this point. What you describe is not science. Data collection? Yes. Useful? Yes. But not a hard science. Filling in data points and fitting a trend line is not necessary science. If you cannot predict with great accuracy (you can guess, but current climate models w/o very large error bands do not match reality at this pt). I ridicule nothing. I point out you follow faith in models instead of science. There is a method to science. Unproven models are not it. Sure. I dislike the southern drift of ocean data points. There is no accounting for localized temperature collection and the upward trend that can result from urbanization. There are many many more. But suffice to say, without isolating as many variables as possible... corrupt models arise. But variable isolation is one of the keys to good hard science and allow analysis. There are very few published papers without documented and repeatable results in a hard science journal. As it stands now climate science is hardly repeatable. Cherry picked data is more the norm in this soft science. Unbiased: You said: "But variable isolation is one of the keys to good hard science and allow analysis. There are very few published papers without documented and repeatable results in a hard science journal. As it stands now climate science is hardly repeatable. Cherry picked data is more the norm in this soft science." Variable isolation is the way statistics was taught in the 1960s. Since then it has become easier to crunch data with computers and we try to look for interactions of variables in systems. It turns out it is much more efficient to allow interactions unless you have a system with truly isolated variables. If there are interactions you want the statistics to point them out. Here are some sites with good explanations of the process. There are hundreds of books on statistical analysis and they will show you why you must look at the interaction of the variables in complex systems. You mention the urban heat island effect. That is a good example. The BEST team set out to prove the urban heat island effect and, instead, showed it was not a significant contributor to the measured increase in temperature. They have done the most complete job I have seen on the application of modern statistics. Let me know if you have any questions about what I have shared. Thermo, I am familiar with statistics and DoE. I am well aware of the strengths that they can provide.... as well as the weaknesses. They can show relations... but they don't always help answer the why. Then you have to filter for 'false positives' if you will. For a DoE to work, at the end of the day, there needs to be a moderately controllable variables. Interactions are important and it is quite likely more than a few remain undiscovered (for climate science). I will eventually take a look at the Berkeley site (when I have some free time...), but if it is associated with the University... that is hardly a neutral source... And a quick glance at the quick facts makes it obvious what they believe. I'll look into the methodology and whatnot. Assumptions are dangerous things in a statistical analysis. Thermo, I'd appreciate it in the future if you'd try to be a little less condescending in your posts in the future. I don't know if its intentional, but that how you came across to me. The science is as hard as ice. Build your wisdom from from the mechanisms of the blessed Element and all are revealed. It is those who would bear false witness who deceive us otherwise. The key to the past, present and future lies in the Water. As the the Earth "warms," the blessed avatar of Water, ice, melts, saving us from our folly. Even should the ice disappear, Water will bless us and keep, as it did in ties long past.